Shigen battles Logan fiercely, showing his superior fighting skills while Hideki takes Mariko to another room. During the fight, Logan manages to end up in the conference room next to the room Hideki is in. Hideki wants to shoot Logan with one of his toxic darts but Shigen stops him. Shigen and Logan continue to do battle while Hideki grows concerned that Logan might win and tries to get a shot but is stopped by Kikyo, who takes the dart instead. 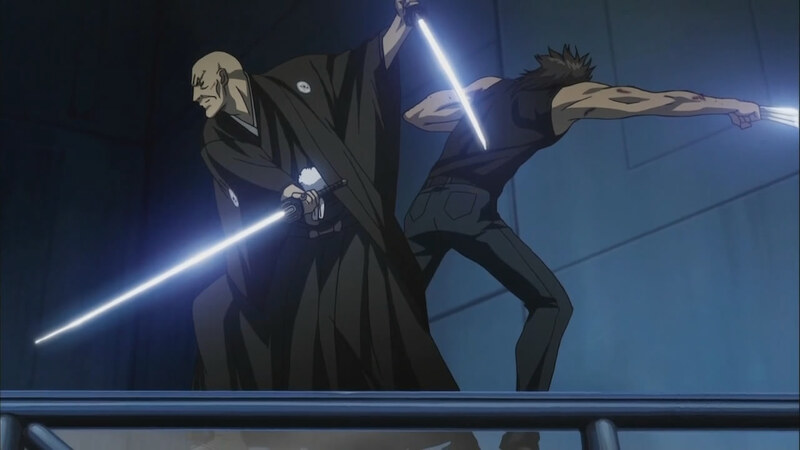 Logan manages to disarm Shigen but then discovers his opponent also knows karate in addition to the samurai sword arts. Further to that, he’s wearing full body armor which is able to deflect Logan’s claws. Logan goes on the attack and the two end up going out a window and falling many stories into a pool below where their fight continues. Meanwhile, Hideki takes Mariko to an underground chamber where his father is entombed. He reveals that he was the one who caused his father’s death and now that he has access to the Yashida clan’s finances and power, he’s going to destroy Dragon Palace, killing Mariko’s father and Logan, and then build anew as the top crime boss of the Far East. However, he and Mariko will be OK since they are in a designated shelter. Back on top, Kikyo and the injured Yukio watch Logan battle Shigen and eventually win. Logan allows Yukio to make the killing blow before she too dies in his arms, confessing that she killed Asano. Logan heads down with Kikyo as the tower blows up around them. They make it to the underground crypt/shelter and manage to pry open the heavy metal doors a crack. Kikyo tells Logan to go through while he holds it open, which Logan does. The door shuts again and Logan faces Hideki. Hideki shoots the advancing Logan with one of his toxic darts and the poison takes immediate effect. Mariko races to his side as Hideki plans to shoot Logan in the head with a regular gun just to be safe. Mariko attempts to defend Logan but is tossed aside. However, Logan has the dart in hand and stabs Hideki with it, killing him. 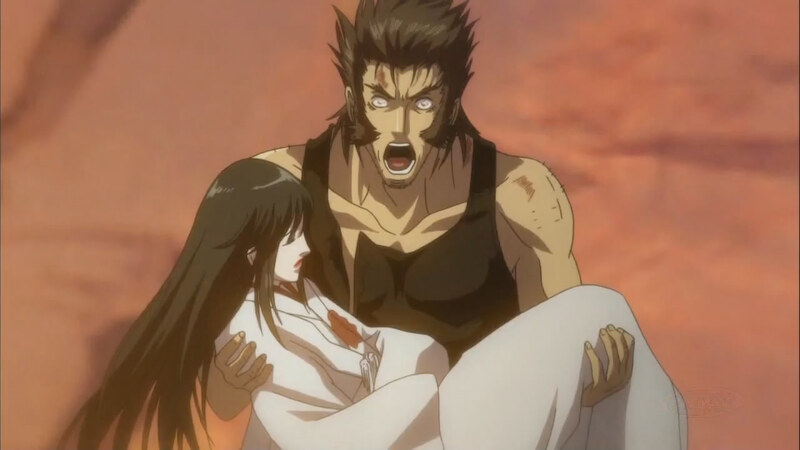 Unfortunately, Hideki shoots Mariko in the process and she dies in Logan’s arms after confessing her love for him. Sometime later, Logan and Kikyo have their fight. Gah! Whatever. Seriously, what a jacked up ending. I had thought that the anime writers would go the way of the comic book and have Mariko choose to take over the family business, howbeit for good rather than crime, and sacrifice her love for Logan in the process. Instead, the writers kill her and everyone else. Since Logan is in the forthcoming X-Men anime series, guess who must have won the fight between himself and Kikyo? *_* So in the end, I’m left thinking, “so he did all this for nothing.” Now, that’s a valid, tragic ending but not the one I wanted. The revelation that Yukio killed Asano was initially surprising to me but then as I thought about it, I realized it made sense. 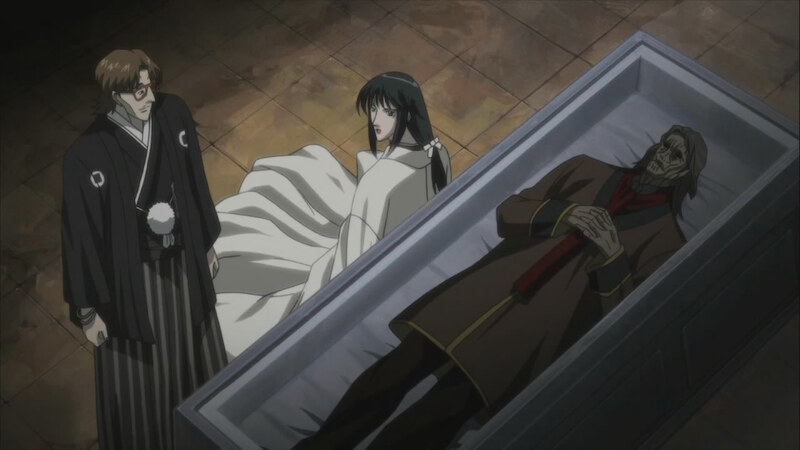 After all, Kikyo might be an assassin but he had such a strict code of honor that his killing of Asano didn’t quite fit the bill of how Kikyo did business. So in the end, the anime writers did have Kikyo take the role of Silver Samurai but apparently decided Kikyo too must die since as I said earlier, Logan lives. Of course, it is possible that Kikyo might still be alive since the writers left that open but at this point, I don’t care. I’ll write some final thoughts later but for now, I walk away from this episode with a bitter taste in my mouth. « What If FUNimation Licensed This? Guess they didn’t want Mariko lingering around in the background for the next series. She’s currently dead in the mainline Marvel setting (i.e. until a writer decides that it would be neat to bring her back). As you noted she survived the incident that this series appears to be very loosely based off of, but she was killed off later on – leaving an adopted daughter behind. So far as I know, Yukio’s still alive and well (she’s acting as foster mother for the adopted daughter) in the main Marvel setting, which leaves me puzzled why they offed her also. This series appears to have been a rather pointless story, all things considered. I guess you weren’t aware of how this all turns out in the Marvel universe. There were many differences, but in the end this was essentially the first few issues of Wolverine. Mariko’s fate isn’t determined in those issues, but they eventually come to the same result with Mariko’s death. It would be nice if you could see how this affects his character in the full scope of his back story because while it might seem senseless it does have a huge impact on Logan. No, I didn’t know she was dead. Then again, I stopped collecting comic books around 1994. This series appears to have been a rather pointless story, all things considered. Mariko’s fate isn’t determined in those issues, but they eventually come to the same result with Mariko’s death. Well, Mariko took over that Yashida clan and Logan was to marry her when Mastermind came in and ruined things. Even after that was cleared up, Mariko wouldn’t marry him because she put the clan first but she still loved him. After that, I’m not too sure what happened. It is a bummer to hear that she got axed. There’s one significant difference, though. As I noted in my first post (that was me – forgot to add my name), Yukio’s still very much alive in the comic books and is a good friend of Logan’s. This series apparently killed her off instead. I’ve decided to post this on your blog since you were the most positive about the series compared to the other bloggers opinion I have read. I have realized Marvel has basically no interest in these 4 animes. Therefore they didn’t want to actually integrate them with the universe, but they also didn’t want to give them a parallel universe/dimension. So they come off as fillers for the Earth616 continuity. The main trope of the Madhouse-Marvel collaboration animes is STATUS QUO IS GOD. Then again this is the main trope for the entire multiverses of both Marvel and DC. Both franchises are way too big and profitable to avoid this trope. They are all about the titular characters that go to Japan, get in a conflict there, and the story ends with everyone relevant to the plot DEAD(other than the titular characters). They can not afford to let any secondary character alive because this must not expand into anything more than a filler. Out of all 4, Wolverine had the most potential because the main story actually included something in Japan with Japanese people. Neither Iron Man and Zodiac nor the Xmen and Umen had anything to do with Japan. I have no hope for the last two series. Overall I am not enraged, I don’t think Iron Man was the worst thing ever, but I’m really really really disappointed, disappointed that they never had the guts, the will, the desire, to make this something awesome. It’s like Marvel and Mad House were forced to collaborate and had to come up with something. These animes are more a result of a hate-hate relationship then of a normal productive relationship between two companies. Not apparently. ^_^; Interesting that Marvel kept Yukio alive when they killed Mariko. Wow. Well, I was pretty excited at first but that waned toward the end and then the ending killed everything (no pun intended). I only glanced around at some other blog entries. I don’t tend to read blogs following series I’m blogging because I don’t want to be influenced by what they say (if that makes sense). Neither Iron Man and Zodiac nor the Xmen and Umen had anything to do with Japan. I have no hope for the last two series. Well, X-Men did have some dealings with Japan other than just Logan. If my memory serves, it was Logan’s wedding that got them all to Japan for the first time. It was Yukio who teamed up with Storm and taught her that it was OK to let go of the faux goddess persona Storm had long held onto. That’s where Storm got rid of her plants, went to a mohawk hairdo, and truly became the leader of the X-Men. Had she not encountered Yukio, I don’t think she would have been that good a leader. My memory says that Kitty Pride has some Japanese connections but I don’t remember exactly what. I want to say there was either a series with her or an X-Men story of her in Japan. The more I think about it, the more I’m remembering X-Men having some minor ties with Japan. I’m pretty sure the Japanese hero Sunfire helped the X-Men back when characters like Storm, Wolverine, and Colossus were introduced. I just reviewed this and the Iron Man anime. This episode was underwhelming. Wolverine looked too weak, and now the whole journey feels like a waste. And that battle with Kikyo would have been nice. The ending felt un-fulfilled.